"More information will be released as it becomes available," Fallin said. The X-37B space plane set to land this week is known as the Orbital Test Vehicle 2 (OTV-2) and looks much like a smaller version of NASA's reusable space shuttles. Unlike NASA's shuttles, the OTV-2 is completely unmanned and is powered by a solar panel that allows it to stay in orbit for months at a time. 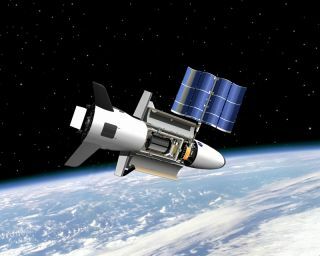 Air Force officials have said the estimated mission length for its X-37B space planes (there are currently two) is about 270 days, but the OTV-2 mission has far outlasted that timeframe. The OTV-2 mission launched into orbit on March 5, 2011 and has racked up more than 460 days in orbit so far. The Air Force's X-37B space planes are built by Boeing and originally began as a NASA test program that shifted into the U.S military's control in 2006, first to DARPA and then to the Air Force, due to funding issues. Each X-37B spacecraft is about 29 feet long (8.8 meters) 15 feet wide (4.5 m), and has a payload bay about the size of a pickup truck bed. The spacecraft are launched into orbit atop unmanned Atlas 5 rockets and are designed to guide themselves back to Earth on autopilot by re-entering the atmosphere and landing on a runway at Vandenberg. The OTV-2 mission and its predecessor were launched from Cape Canaveral Air Force Station in Florida. The first X-37B space plane, OTV-1, launched in 2010 and spent 225 days in space. This OTV-2 mission has more than doubled the duration of that debut flight. Air Force officials have said they intend to launch the OTV-1 vehicle on another test flight soon, possibly as soon as this fall. You can follow SPACE.com Managing Editor Tariq Malik on Twitter @tariqjmalik. Follow SPACE.com on Twitter @Spacedotcom. We're also on Facebookand Google+.